Do you need to move a single item or multiple items? Price includes up to 10 miles distance. With 1000s of jobs successfully completed, and rated the No.1 Man and Van Croydon by our customers, we provide you a professional, friendly and reliable removal service with unrivaled flexibility to suit your needs. Whether you need to move a single item, multiple items, or a whole house, our low cost removal service is sure to save you time, money and hassle. Vans are equipped with trolleys, straps, protection sheets, tools, and moving crates to make your move as efficient as possible. Excellent service. Paul is efficient, honest, kind, friendly and has a great sense of humour. He makes the experience much less stressful than it could have been. I would definitely recommend him without hesitation! I work with couriers in my profession, and also move home a fair bit being a renter in London. Paul and his business, CityVan, are simply, de facto, THE best I’ve encountered at what they do. The prices are, if anything, lower than they should be. Whatever it is that you need: patience, care, flexibility… You’ll get it from them. I’m delighted to see that other reviewers have remarked on the manner, as well – often times using these services comes at a stressful time in one’s life. CityVan takes that stress out of the equation – in a very good way, and while retaining perfect professionalism, it’s a bit like working alongside an old friend with a van. For these prices, and with this level of service, you’d expect a catch – but no, there is none. The vehicles are pristine and (while promptness on the part of the customer is, I’m sure, appreciated) there’s no staring at the clock, no pressure, nor any driving too fast (all of which I’ve come to expect with other services of this sort). I would, and do, recommend CityVan to anyone, and in the strongest possible terms. Trust me, and trust Paul and CityVan. Since discovering CityVan I have never, and will never, go to anyone else for the services CityVan provide. Paul was incredibly efficient and helpful – he made the whole moving process so much easier. He was really friendly and had a positive attitude throughout – despite moving to a second floor flat with no lift, there was zero grumbling! He was careful with my belongings and a very quick worker. Couldn’t recommend enough – a bargain to relieve the strain and stress of moving home. Paul was great. He put his back into carrying the stuff and provided an excellent service. Competitive price and a good honest person. I would recommend him without hesitation. Paul and his son were so helpful, they were very careful with my items. They put me at ease and having been in the van with them to move to my new place they made me feel very comfortable. Would definitely recommend them! Would recommend for easy, pleasant and stress free move. Friendly, helpful and a good humoured service. Was a tricky move for us having to wait for mortgage completions, the movers were extremely patient and good natured about it all. Moved us with no hassle and no damage to our stuff or the property, in short I would highly recommend. I would totally recommend Paul. He was extremely professional and a pleasure to meet. He was able to take a booking at very short notice, was very punctual and was able to assist with a very awkward, large artwork from the central London art gallery where I work. He was very careful and attentive and understood exactly the requirements for transporting art safely. The van was spacious, clean and well stocked with straps and blankets, etc. Paul is a joy to chat to and his rates are very reasonable given the level of service. Highly recommended. Thanks Paul. CityVan are amazing. Paul runs a totally professional man and van service in London. They were on time, friendly, efficient and took great care. Communications were excellent. It was a pleasure and I highly recommended them. Paul was my first search and my first pick just because of his reviews and promptness! I called him at 8.30 am yesterday and had my moving finished the same day! What a legend! Great service, such a nice lad, great laugh, nice chat..I can not say enough.. he’s made an impression! A very good one! He’s my pick and my recommendation! Wishing the best for you and your business. Once again a massive thanks, you made my life so much easier. Paul was a delight to move with. Careful and courteous, and also a good laugh. Would definitely recommend! Absolutely amazing! Paul is really helpful, very professional and accommodates every request. Made the journey very pleasant as well, Paul is really friendly and easygoing. Would recommend to anyone and will definitely use this great service again. I used CityVan to help me move from South to North London. I was dreading the move but Paul was a pro and made the whole thing relaxed and stress-free. He also comes armed with excellent stories about his cat, Eric. What more could you want? Paul was so accommodating, friendly and professional. Waited for us, was so helpful. Overall great experience, would definitely recommend Paul and will be certainly using his service again. Paul was amazing and was on his own helping us out. Very big removal van and no trouble getting everything in. He didn’t mind doing abit extra for us without extra charge and it was a good price already. I’m definitely not in a hurry to move again (it was the 3rd floor ?) but if I do I will use again. Paul is the kindest and best mover! Paul helped my husband and I move the heaviest sideboard today. We moved it out of a beautiful mansion in Kensington and up to our first floor apartment. Despite the narrow staircase in our home and all the glass in the old owner’s home, Paul was so kind and amiable – and our sideboard made it here safely! I would definitely call him again and use the service – responsive, communicative and easy to work with. Really reliable service, a very patient and helpful man and van who clearly understands the stresses of moving House! Would highly recommend, excellent value for money too. My removal angel!!! Late notice for removal for a Saturday morning and came absolutely with nothing bad to say from me. Reliable and affordable. Couldn’t recommend anyone to use other than Paul. Clean van, patiently waited and had everything available to keep my items safe and secure. Regards, Anisa. I needed a man and van in London to move some items to storage. CityVan were very prompt, professional and quick to complete the job. Highly recommended. I’ve used many man and van companies over the years and have never been overly impressed with the service received. 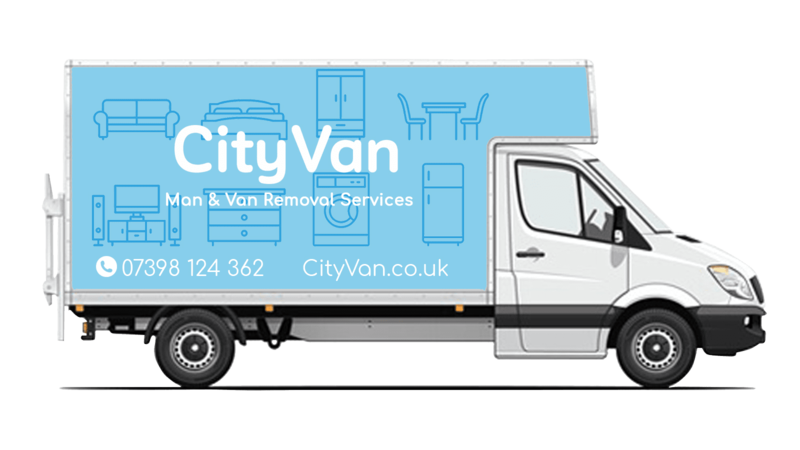 I used Cityvan for the first time this week to move some heavy and fairly expensive furniture from west London to east and have to say Paul from Cityvan is light years ahead as a service provider from what I’ve experienced to date. He’s friendly, helpful and very competitive. Nothing was you much trouble and he arrived when he said he would and carried out the job carefully and without issue. Thanks Paul, I’ll be back in touch soon for your next mission.